Remove Flute Keys for flute re-padding. Please note: This is a very basic description of how replace flute pads. While flute pad replacement can be done by the "do it your- selfer," replacing flute pads often requires the patience and skill of a professional. Do not attempt to replace flute pads if you are not completely competent and comfortable using the required flute pad replacement / flute re-padding tools. The Instrument Clinic assumes no liability for any damage you may cause to the flute or other property while replacing flute pads. Start with the trill keys and move the rest of the way down the flute. Place the keys neatly on a soft pad or towel in the order you have removed them. If this is your first time re-padding a flute, it might be useful to video tape or photograph your self to serve as a guide when you re-assemble your flute. It can be very helpful to immediately re-insert screws after you have removed a key. This will help avoid any confusion on where the screws belong while replacing flute pads. Once all of the keys are removed, remove all of the flute pads from the key cups. Keys with flute pads that are glued in will require heat. Most other flute pads are held in with screws. Measure all of the pads individually and compare the sizes with the pads you have purchased for flute pads replacement. Do a test fit with each key. The flute pad should fit comfortably in the flute pad cup. If you have to force the flute pad in, you need a smaller diameter flute pad. If the new flute pad is very loose in the cup, you need a larger diameter flute pad. Check the thickness of the flute pads. 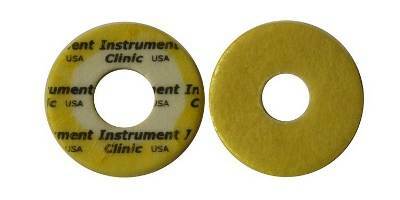 If the replacement flute pads are too thin, flute pad shims will correct this. If replacement flute pads are too thick, it’s best to order thinner flute pads. All pads should be punctured on the side with a pad prick or needle to allow moisture to be released when replacing flute pads. Apply heat to the flute pad cups that require adhesive and thoroughly remove any leftover adhesive out of the flute pad cup. Be careful not to burn yourself and have fire safety equipment readily accessible during flute pads replacement. Once the flute pad cup is clean, insert 1-3 adhesive pellets in the flute pad cup and apply heat. You need enough heat to melt the pellets, but do not heat to boiling. Gently insert the flute pad into the flute pad cup and allow the key to cool. Replace the key on the flute and, using an appropriate heat source (ideally a micro torch), carefully apply a small amount heat to the flute pad cup. You need to be extremely careful not to over heat the adhesive. Allow the replacement flute pad to level itself over the tone hole. 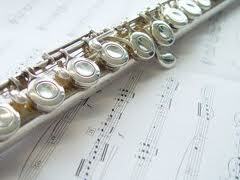 You may need to adjust the flute pad with a pad slick, or other small, flat piece of metal. Check the flute pad for leaks with the feeler gauge or leak light. If there is a leak, apply heat and make the appropriate adjustments to the flute pad. Insert flute pads held by screws into the flute pad cups. Insert shims, if necessary, to achieve proper thickness. Re-install each key with the new flute pad on the instrument. Check for flute pad leaks with your feeler gauge or leak light. It’s easiest to do one key at a time. This is also an opportunity to oil the pivot points of each key with flute key oil. This is also the best time to check your flute key height with a flute key height gauge (if available). Adjustments can be easily made with a flute key leveling tool (if available). If the instrument was in good condition prior to installing new flute pads (and correct sizing was done on the new flute pads), very few adjustments should be necessary. This step should be done only after all of the flute pads are perfectly level and there are no leaks. No key should have to be pressed hard to avoid a leak, so be patient and continue making adjustments if necessary. Moisten the face of each flute pad with a pad slick and a small amount of water. Using key wedges, force the keys to be closed and allow to dry over night. Be very gentle when inserting the wedges to avoid bending keys or damaging cork. A “ring” should develop on the pad if everything has been done correctly. Leave keys wedged shut for at least 24 hours, the longer, the better. It can be helpful to re-insert the flute key wedges after playing the flute to be sure to retain the ring.